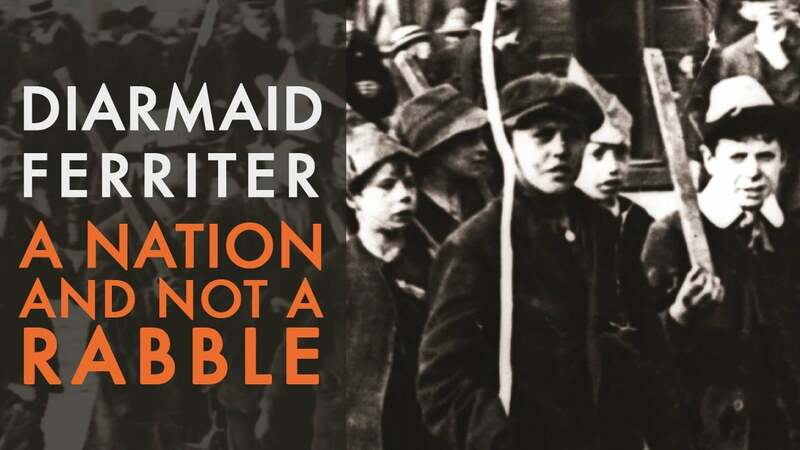 A Nation And Not A Rabble: The Irish Revolution 1913-1923, by Diarmaid Ferriter. Profile Books, March 2015. ISBN 9781781250419. 528 pages. Price: €47.40. Diarmaid Ferriter, history professor in University College Dublin, has become an unlikely celebrity, very much in demand for astute multi-media commentary on not just past national milestones but on the crucial issues of the day. His sympathy lies with ordinary people striving for grassroots democracy. His latest book, his fifth published in-depth study of essential aspects of Irish life, focuses on a decade of turmoil overlapping with the Great War. A Nation And Not A Rabble; The Irish Revolution 1913-1923, is rightly recognized as ground-breaking in its scope and detail. My uncle, Florence O’ Donoghue, a busy barrister in London and political candidate, began, from the late 1940s, to write a book on the same period, and left behind an unfinished draft with associated correspondence, now deposited in Trinity College Dublin library since his death in 2014. He was born in Kerry to a father in the Royal Irish Constabulary, British-employed police stationed around Ireland who were targeted as occupying enemies during the revolution. Over 500 officers were killed before their disbandment in 1922. As Ferriter charts in a chapter entitled, Homes Fit For Heroes, others left Ireland, the lingering sense of danger too much for them. Compensation schemes catered for those remaining, and ex-servicemen. My grandfather took the retirement package and, while a typically well-liked local, anger about trouble-making rebels trickled down through his son’s writings, at least until Florence began revising, where his tone became more even-handed. The division of loyalties affected most Irish families, severest since in Northern Ireland. For over sixty years, Florence contributed book reviews, mainly on Irish subjects, to leading periodicals. He would have relished and envied Ferriter’s book in equal measure. In turn, Ferriter has kindly expressed interest in inspecting my uncle’s papers. The story of the Irish battle for self-rule has wide resonance. Irish people had been emigrating since the Great Famine, primarily to America which took 1.8 million between 1846 and 1855, but also to most other countries. By 1911, at 3 per cent, Australia accommodated a greater proportion of Irish-born residents than America did. Fergus Campbell’s study of emigrant responses to the Irish struggle is quoted: “Concern with Irish affairs reached new levels of intensity in the US and Australia between 1914 and 1921,” but newcomers had their own problems, with increasingly hostile policies of adopted countries. Ferriter praises the Australian, Calton Younger, for his 1968 book, Ireland’s Civil War. After spending three years as a POW, in the RAAF during WWII, Younger sympathized with the oppressed. Public accounts from all perspectives are exhaustively covered. The decade of Irish resistance to the British Empire, upsetting its concentration on spreading European disorder, left an illuminating paper-trail, as another historian highly esteemed by Ferriter, the Canadian, Peter Hart, pointed out, making it “perhaps the best documented revolution in modern history.” This presents an opportunity for deconstructing social factors in extended terms, of ethnicity, power rankings, gender and so on, and Ferriter ably rises to the challenge, drawing on a myriad of sources: letters, literature, memoirs, fellow historian accounts, military pensions’ applications, state documents from national libraries, newspapers, Dáil records and the Bureau of Military History, all fully annotated. Contributory background events invoked include failed past insurrections, staggered parliamentary progress on Home Rule, militarization of Ulster Unionists, labour and land unrest, democratic and suffragette movements, poverty, and global growth of nationalism coming to a head with Serbia. Layering on veracities for an immersive experience, the author constantly cautions against flippant interpretations, as propaganda abounded. The cover makes clever and unapologetic use of tricolour elements, recalling a speech Ferriter mentions given by Irish President MacAleese at a conference about 1916. Her stalwart defense of the rebels’ progressive vision and strategies stood out after decades of discomfort and suppression in the official record around the republic’s bloody birth. The relative passivity of those high-minded citizens leading the Easter Rising, to little public support initially, was followed by more organized violence during the War of Independence, and most enduringly traumatic of all, during the Civil War after Michael Collins’ deputation signed the Anglo-Irish Treaty in 1921, hastening partition of Carson’s Protestant Ulster, and De Valera’s political rise. Insensitivities about excessive damages inflicted, reversals around female equality, power games, and class snobberies affecting welfare responsibilities, co-existed with idealism. The wresting of self-rule through guerilla warfare, political imprisonment and infighting, and the psychological legacy, are no longer shirked. As anniversaries approach, reflections on commemorations presented in final chapters are enlightening. Ferriter warns against hijack by one-sided interests and other risks. He outlines achievements to date, including state visits and acknowledgement of shared heritage, and makes further suggestions. Given his knowledge and engagement with the era, his appointment to the official commemoration advisory committee is entirely fitting. As revealed to a newspaper interviewer, Ferriter, of famed ancestors in Dingle, was almost born at a protest against the 1972 Bloody Sunday massacre of Catholic protesters in Derry, when his mother reluctantly stayed behind while his father joined demonstrators outside Dublin’s British Embassy. Through his research he reconstructs the context of such disturbances, and the broader understanding that results serves his readership well.